eastern island in Halong bay and was recognised as the World Biosphere Reserve by UNESCO. The resort divided to two separate areas sprawling on two different direction beaches. 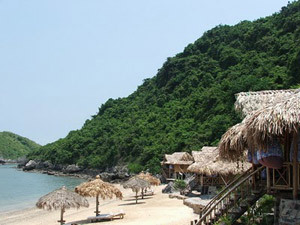 The beach directed toward Cat Ba town is Sunrise Beach and the other beach directed toward East Sea is Sunset Beach. All the bungalows made from all-natural meterials and everything is designed to compliment each facility and its natural surroundings. Definitely, an idyllic place to recharge frayed nerves, with its cozy ambience of bamboo and hut in its very Vietnamese type accommodation... No concrete is to be seen anywhere. If you're thinking of getting away and escaping to the mob, then find out all about us. but you will surely find our accommodations a unique and delightful experience during your stay here. All rooms have their own private shower and toilet, with a service family assigned to look after your needs throughout your stay. None of our rooms are air-conditioned. We make use of "natural" air conditioning ! is a single bed size .All these rooms have a private spacious balcony with a splendid view directly to the sea and a quite nice big bathroom in the back makes the room different from anything else. The room itself is not so big - it gives an incredible intimacy and a couple feels the "jungle" and alots of natural trees around. These rooms have very nice seaview even lying on the bed. This house is good for couples who want enjoy a silent atmosphere and look at stars at night. guest with young children. Of course it has its own private toilet and bathroom... And it's own private balcony with great seaview and of course there is a hammock. The elegant Sea Wind Restaurant, sitting in the middle of the sandy beach surrounded by fresh natural air with 2 floors consists of interior and exterior dining hall. So, it is your choice to join the meals with some new friends, from over the world, and watching the satellite television or sitting somewhere else on the beach or in the second floor. As you may suspect the locally caught seafood in our restaurant could not be more fresh. Topping the menu favourites are stir-fried crab in tamarind juice, delicate spring rolls with incredibly delicious fillings and various fish, prawns and squid cooked in all styles to your very own desire.